Which are the best dive watches for you to buy? As you know, there are lots of options out there when going to buy a dive watch. You can spend anywhere from $20 to $20,000 (OK, maybe that's a bit of an exaggeration but you get the point). You have to decide what features you want the watch to have. What price range you are targeting. If you will wear it out of the water (some really do look cool). And on and on. To help make your buying decision easier, we have picked some diver watches for you to consider in the mid-range, inexpensive, budget and yes, cheap and very cheap categories. Of course, which of the following picks from our list of best dive watches will suit you depends on your budget and what you want in a watch. (For our picks of the best scuba diving watches in the luxury, high end and top end categories click here. For our picks of the best diving watches for women click here.). So how did the watches make our list? First, to qualify as a top pick, they all had to be water resistant to 660 feet. (See our buyers guide (link above) for an explanation of why 660 feet). After they met this criteria, we read through the feedback, ratings and reviews of all contenders. A watch had to receive over 4 stars out of 5 to even be considered. If the vast majority of users had positive reviews of the watch, we figured the odds were good that you would like it also. We recommend only those that we think would fit your needs and we would be proud to own ourselves. The links for the recommended watches will open in a new window to our partner's website. 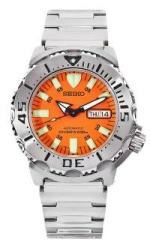 From there, you can read more of the detailed reviews and features and see if that scuba watch will fit your needs. Since dive watches can get discontinued and new models are introduced, we wanted to make sure we are considering all that is currently available. To that end, we will be updating our picks for best dive watches every 6-12 months to ensure you get the benefit of the most current selection. So if you are in the market for a dive watch for the diving season, these picks are for you. There are several new picks from us this year. We hope you enjoy the selection and find one that will work for you. We have a couple picks in this category. For this price, you can get a very good and very sharp looking watch without spending a fortune. The watches are of high quality and should last a very long time. Our first pick in this category is this good looking Citizen model. I think this dive watch does everything but wash the dishes. It continues to get great reviews and earns its place on our list for another year. This watch is water resistant to 660 feet and looks good both in and out of the water. The case, band and bezel are all made of stainless steel. This watch charges in natural or indoor light so you never have to worry about changing the batteries. Which is a great feature since you don't want batteries dying if you are using it as your timing device while scuba diving. Other features include atomic timekeeping, perpetual calendar and a 1/100 second chronograph that measures up to 24 hours. And if you are on a whirlwind tour, this pick for best dive watch can give you the world time in 43 cities! 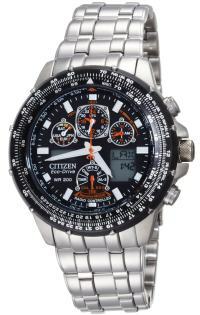 Find out more about this Citizen's model here. 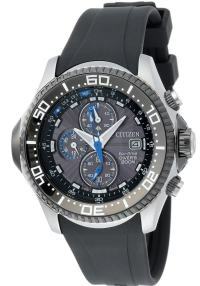 For our next choice of best dive watches in this category, we have another Citizen model. This dive watch has a sportier look and boasts a rubber strap. The rubber strap also helps lighten the load on your wrist when compared to a stainless steel strap. Some people complain about the heaviness of an all stainless watch and if you agree this might be a good choice for you. The case and unidirectional bezel on this model are made of 2 tone stainless steel. It is water resistant to 660 feet so it should meet all of your recreational scuba diving needs. This model has full chronograph function and since it is powered by light, you never have to worry about the batteries dying on you. Read more about this Citizen model here. This Invicta model is a new entrant in this category of best dive watches. This is one heck of a watch and makes a big splash in and out of the water. Be warned - this is a BIG watch. Almost all reviewers commented on the size so if you want to get a big man, tough guy watch, this may be the one for you. First off, this watch is water resistant to 3,280 feet (1,000 meters). You will never have to test this out but it is a nice bragging point. The case is made of polished gun metal stainless steel while the strap is rubber. This watch is quite the looker. It has 3 chronograph functions, luminous hands and a unidirectional bezel. 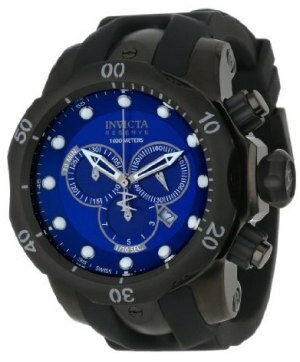 Find all the details on this Invicta Men's Watch here. Our first pick for best dive watches in the inexpensive category is a repeat winner from last year's pick. It continues to be a best seller and has rave reviews from many users. It is a Seiko model. I love the look of this watch and judging from its' reviews, I am not alone. It is rated to 660 feet and is made of stainless steel. It functions automatically with the movement of your arm and does not need a battery. It has a screw down crown and a Hardlex crystal face. This particular model is in orange so it really makes a statement (it is also available in black if you prefer). Get more details on this Seiko model here. We have another repeater in this category for best dive watches. Why mess with a good thing? This great looking watch is an Orient model. This is a sharp looking dive watch and the case and band are both made out of stainless steel. This watch is made for scuba diving and is rated to 660 feet. It is an automatic watch so it functions with the movement of your arm and doesn't need a battery. 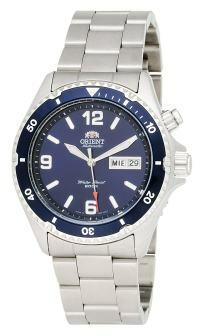 It also features a blue unidirectional bezel and a screw down crown for added protection while you are diving. Find out more about this highly rated Orient model here. Our new entrant for best dive watches in this category is a Casio model. 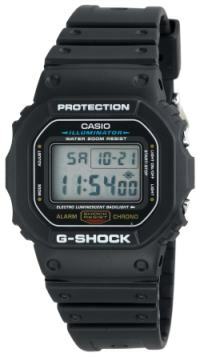 It is part of the ever popular G-shock line from Casio. While this watch has been around awhile, it continues to get rave reviews from wearers. This is another one of those watches that seems to do everything. Aside from the normal time, date and alarm functions (5 alarms), this watch also measures altitude, barometric pressure and temperature and has world times for 33 cities. It is solar powered (recharges batteries) and has an atomic timekeeping function. The case and band are made of resin and the watch is water resistant to 660 feet. So if you like gadgets and lots of functions, I think this watch will make you very happy. 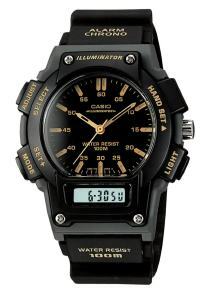 Read all about this Casio Men's Atomic Watch here. If you need a dive watch but don't want to spend alot of money (or don't have alot of money to spend), you can find some pretty good values in this category. I had to eliminate some very good watches in this category since they were only rated to 330 feet. As I previously mentioned, 660 feet is the preferred depth rating for a scuba diving watch. However, once you reach this category, you might be more comfortable using one rated to 330 feet since it is not that huge of an investment. For the time being, I am sticking to the 660 feet recommendation here. OK, this first pick for the best dive watches in the budget category are for all of you out there who like to stand out from the crowd. As you can see from the picture - this is a dive watch that will get noticed. It is a Casio model. Of course, if you don't want something so stand-out, they also have similar watches in black ). This watch has some really cool features - like tide and moon data and world time with 29 time zones. And in case you are a late person, it has five alarms. No sleeping in anymore. You get alot of watch for this price point. If you are an outdoor person, this watch has proven to be extremely durable and can stand up to alot of wear and tear. 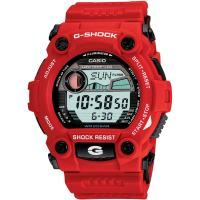 Find out more information on this Casio Men's G-Shock Red Watch here. Choice #2: Next up for our pick of best dive watches between $50-$100 is actually another Casio model. This pick is a different style than our prior choice and is quite a bit more "subdued". However, this does not take away from its functionality and durability. This watch is water resistant to 660 feet with a resin-stainless steel case. This is a shock resistant watch and the manufacturer boasts that it can withstand pretty much anything you want to throw at it. And according to the reviews, the watch stands up the claim. If you like to get rough and tumble out there, this is a watch for you at a great price. Other features include world time from 29 time zones, 1/100-second stopwatch, 3 time modes (elapsed time, split time and 1st/2nd place mode), 5 alarms and a battery life of up to 3 years. Get more detail on this Casio model here. The next pick in this category is a Stuhrling model. This is a new entrant this year and I am impressed by all the great reviews this watch has received in a short period of time. Buyers just love this watch. Unlike a lot of watches, many buyers commented on the excellent packaging and presentation which was unexpected of a watch at this price point. This is a more classic style of watch which will look great in almost any situation. Wear it to work, to dinner or for a fun day of diving. The case and band on this watch are made of stainless steel and the watch face is Krysterna crystal. This crystal is proprietary to Stuhrling and they state that it has more strength and is more shatter resistant than sapphire and more scratch resistant than mineral crystals. This watch has a unidirectional bezel and is water resistant to 660 feet. 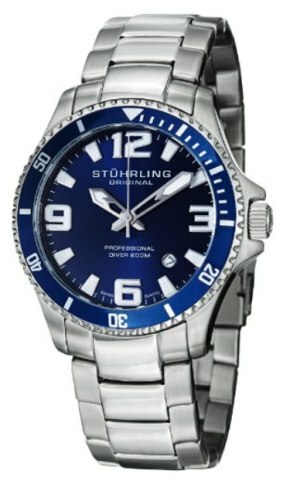 Get all the details on this Stuhrling Men's Diver Watch here. I have a few choices of best dive watches for you here. 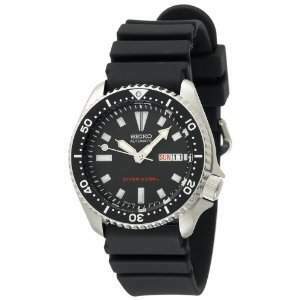 There are alot of budget scuba diving watches available, actually it is quite amazing how many are out there. From all that I have read though, I have narrowed our picks down to three. Hey, they are pretty cheap - so maybe you can buy more than one! I am still sticking to the requirement that the watch be rated to 660 feet to be chosen as a best dive watch. Despite the cheap price point in this category. If you want to get a watch that is rated to 330 feet instead, you will have even more choices but I chose not to go that route (I do in our next category though - the very cheap dive watches; see below). Our first pick is one of the grand-daddies of cheap dive watches. This type of model has been around for quite awhile but it still remains on our list as one of the best bets for a cheap dive watch. It continues to get great reviews so I feel it has earned its place on the list for another go round. 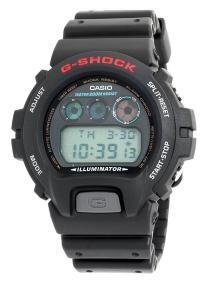 This "classic" is a Casio G-shock model. Both the black-tone case and stationary bezel are made of resin. It is a quartz movement watch and is rated to 660 feet. This watch gets high accolades from almost all its users. 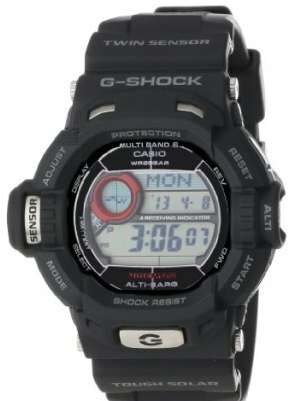 Find more detail about this Casio G shock model here. Our second choice for a best dive watch under $50 is another Casio model. 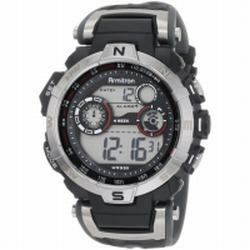 Casio has alot of models to choose from in this category and the quality of the watches offered at this price point has earned them many repeat customers. This second pick, as they all are, is water resistant to 660 feet and has a resin case with a stationary metal bezel. This particular model also features temperature and direction readings which makes it pretty unique among watches with similar pricing. You will also have 29 time zones, 5 different alarms and a stopwatch (perfect for timing those safety stops). Note: You have to calibrate the temperature setting on this watch to take into the account the heat from your wrist (included in instructions). Some reviews say it reads high but I believe this is since they did not calibrate the watch (they just take it off their wrist which works also but you will have to wait 10-20 minutes or so for a correct reading). Get all the details about this Casio compass model here. We are going to post a third choice in this category of best dive watches. It made our list last year and is still winning new converts. It is very reasonably priced and continues to shine in performance. And, drumroll please, our last pick for best dive watches is yet another Casio G-shock model. This one is less expensive than our previous recommendation but still receives rave reviews. The case and the band are all made of resin on this model. Like all our other picks, it is rated to 660 feet. This model is also a quartz movement. You can read more about the Casio men's classic model here. I added this category for the first time last year and it was very popular. So here it is again with updated picks. For this though, I am going to have to loosen my rule of being water resistant to 660 feet. These watches are all water resistant up to 330 feet. In my research, I wasn't able to find a good watch in this category that was water resistant to 660 feet - guess I was just being too optimistic. For the record, my husband and I have both dove with watches that have less water resistance than 660 feet (they were, however, our secondary timing devices) and they have held up very well (I have had my current one for a couple years now). And the way I look at it, if it serves you well for diving for quite awhile and then quits on you, you will still have gotten your money's worth out of it. Not that we expect them to fail, but if they do it won't be a significant loss. But remember, these should only be your secondary timing devices - not your primary or only source of logging your dive time. Our first pick for the best very cheap dive watch is an Armitron model. I think this is a great looking watch and I was surprised to see how cheap it was. This model is rated water resistant to 330 feet and has a resin case and band and a stationary resin bezel. Although this watch is cheap it is not without significant features. This model boasts chronograph functions, an alarm and both a lap timer and a countdown timer. These functions, along with the price point, has earned this watch many stellar reviews. Find out more detail on this Armitron model here. This second pick for best dive watches in the cheap category comes in at just under $25. It is a Casio model but has a much different look than the previous Casio's recommended. This dive watch has both analog and digital displays with the digital display located separately and below the analog face. In my opinion, this makes the functions easier to read. This model is water resistant to 330 and features a resin case and band with a stationary resin bezel. It may not have all the bells and whistles but it has all the basics that make it a useful everyday watch. You will find chronograph functions, an alarm and day-date-month display. If you just want a basic watch that is durable, looks good and is inexpensive, this might be the watch for you. Find out more about this Casio model here. This next pick for best dive watches under $25 is another Casio model. 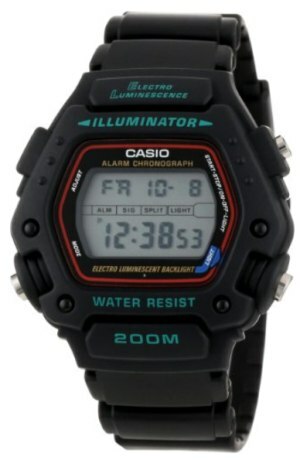 This is a new entrant here but it is a tried and true Casio model and continues to get great reviews year after year. Many reviewers stated they have bought more than one of these watches or will buy another one when their current one wears out. Can't get a better endorsement than that. 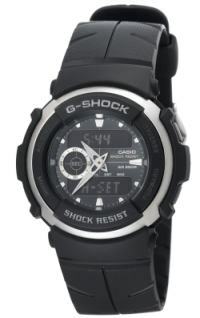 Reviewers also compare it favorably to Casio's higher priced G shock line. This model doesn't have all the bells and whistles of the G shock line but it has all you need in a basic watch. This includes a stopwatch, alarm, date, calendar, 12 and 24 hour formats and accuracy. This model is also water resistant to 330 feet. Many reviewers stated they wear this as a backup timing device on their dives. And Tom Cruise wore this watch in the first Mission Impossible movie. Need we say more? 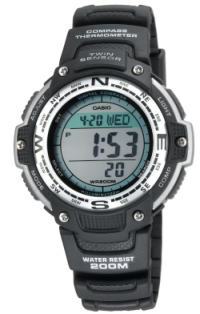 Get all the information on this Casio Men's Sport Watch here. We hope our research for best dive watches makes your choice easier. I know what a pain it is to wade through thousands of picks and thousands of reviews when I am looking to purchase a product. Hopefully our wading will cut down on yours! Please let us know how you like your new dive watch if you purchase one of our recommendations. We would love to hear from you. Click here to see our picks for the best dive watches in the luxury, high end and top end categories. Looking for more scuba diving equipment? Check out our other picks for best gear. We give you our picks for best dive computer, BC's, regulators, masks, snorkels and more.